$3.85 million for a mechanic burned by fuel oil ignited by a defective product. $1.9 million for the wrongful death of a five-year-old boy who fell from the window of a high-rise apartment building where the landlord failed to install proper window guards. $1.38 million to the estate of an eight-year-old child who died of post operative bleeding, proving that the defendant physician had failed to treat the bleeding. $1.5 million from an obstetrician and sonogram technician for failing to detect fetal abnormalities on a screening sonogram resulting in the birth of a child with severe and multiple birth defects. $1.75 million from a construction company for the wife and children of a construction worker who was killed when struck by a temporary support, proving that the defendant violated Occupational Health and Safety Administration (OSHA) regulations. $1 million for a construction worker who suffered a severe leg injury when struck by a truck, proving that the negligence by traffic control officers combined with negligence of the truck driver caused the accident. $1.225 million settlement of wrongful death medical malpractice claim for failure of emergency room doctor consider dissecting aortic aneurysm in the face of classic symptoms resulting in an eight hour delay before the correct diagnosis was made preventing timely surgical intervention. $550,000 settlement of wrongful death psychiatric malpractice case for failure of defendant psychiatrist to recognize escalating symptoms of severe depression resulting in death by suicide. 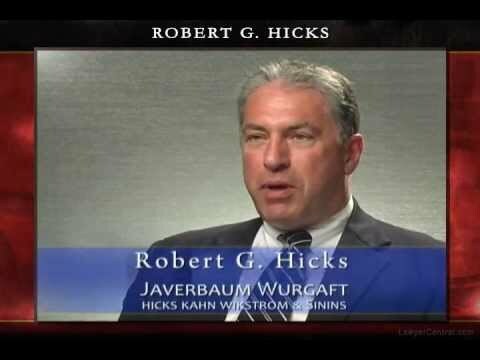 Hicks belongs to many professional organizations and has served in professional leadership positions including President of the Richard J. Hughes American Inn of Court, Chairperson of the New Jersey State Bar Association Committee on Medical Malpractice and as Faculty Member at the American Board of Trial Attorneys Trial College at Princeton University and Harvard Law School. In addition to extensive trial experience, Hicks has had many successes in the Appellate Courts and was lead counsel in Crippen vs. Central Jersey Concrete Pipe, 176 N.J. 397, 823 A2d 789 (2003), in which a widow sued her late husband’s employer for covering up its failure to correct violations found by OSHA in its equipment circumventing the statutory Workers Compensation bar to employee lawsuits against their employer. In 2007, he was named to Lawdragon’s 3000 Leading Plaintiffs’ Lawyers in America list, which includes less than one percent of all the lawyers in America. Hicks has been named in New Jersey’s Super Lawyers every year since it’s inception in 2005. Speaker, NJAJ Educational Foundation, “Medical Malpractice- Pre-Suit Discovery: Making use of Rule 4:11-1”, April 27, 2012.